among top-flight luxury sedans, the quest to impress has bequeathed increasingly indulgent options — some of them actually useful, others better suited for a sky mall catalog — with each redesign throwing something new at the velveteen dartboard for shoppers to scratch their heads and murmur: they thought of that? in this case it's the redesigned 2019 audi a8, which offers nothing less than a massaging foot rest, the piéce de résistance atop a long pile of available luxuries. still, the feature arguably most anticipated on the a8 — conditional self-driving capability — won't make it at launch. the self-driving capability was to be part of audi's traffic jam pilot system, announced in june 2017 as the industry's first level 3 self-driving capability in a mass-produced car. that's a reference to sae international's six levels of driving automation that means, in certain situations — low speeds on barrier-divided highways, in the a8's case — the car can drive and monitor your surroundings while you take your eyes off the road. alas, the a8 won't offer that for american shoppers when it goes on sale in the fall. "as we have stated before, we will introduce level 3 conditional automation on a market-by-market basis when the right conditions are in place," audi officials told in an emailed statement monday. "audi has chosen to focus its attention on getting it right in their home market of germany." but the u.s. market, which is "much larger and more varied in terms of infrastructure, legal frameworks and regulations" at state and federal levels, "requires more testing in the different regions," audi continued. for now, the 2019 a8 can steer, accelerate and brake in certain conditions while you watch the road to take over when necessary — on par with other so-called level 2 systems already on the road. 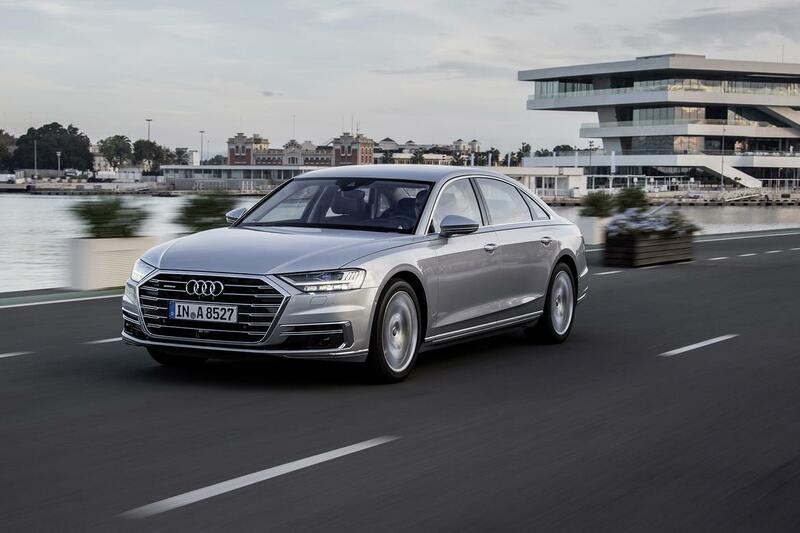 it won't offer a hands-free provision like cadillac's super cruise system, and owners can't upgrade new a8s to level 3 once audi clears the regulatory hurdles. officials confirmed to this week that the 2019 model in the u.s. remains a hands-on level 2 car with no ability to upgrade its self-driving capabilities because it lacks the necessary hardware. nonetheless, it will offer a pile of other autonomous hardware, including what audi claims as the world's first laser scanner in a production car. the scanner works in conjunction with the a8's front radar and camera to create a better image of what's ahead. audi also claims myriad improvements to other systems — from improved lane-centering steering to adaptive cruise control that can better navigate construction zones and other tight spots. all of that means the new a8 may not break new ground in terms of what it can do on the self-driving front, but it could make strides in how well it does it. oh, and it will massage the feet of one lucky passenger. this extravagance might answer a question that few shoppers were asking, but flagship luxury sedans have made such offerings into sport, recent innings of which have pitched us everything from heated armrests to scent-infused air — both available on the new a8, of course. the massager sits in back of the front passenger seat, a prize for whomever beat fellow riders to the punch in the calling of dibs. the sole survivor gets a foot rest that massages from behind the collapsed-forward passenger seat. the foot rest is heated, too — because anything less would be damn near third world. of course, you could just buy a power adapter and portable foot massager (on sky mall!) to stash in the a8's backseat, but that's an inelegant aftermarket solution, plus it introduces a potential crash projectile. to get the built-in podiatric pampering, shoppers have to shell out $7,550 for the a8's four-passenger executive rear seat comfort package, which splits the rear bench into two separate bucket seats with a smorgasbord of controls on the console between. the sedan has plenty of creature comforts without it. for its starting price — a competitive $84,795 with destination — the a8 comes standard with a turbocharged 3.0-liter v-6 (335 horsepower, 369 pounds-feet of torque), all-wheel drive, 19-inch wheels, 18-way power seats, audi's virtual cockpit system and a suspension fitted with air springs and adaptive shock absorbers. no flagship would be complete without new safety systems, and the a8 offers plenty. audi's exit assist system, which debuted on the 2017 a4, no longer just warns passengers if it senses they're about to open the door on an approaching car or cyclist; now it momentarily keeps those doors shut. an available active suspension, meanwhile, can raise the sedan by 3.1 inches in less than half a second when it intuits an impending side impact, helping direct crash forces to lower portions of the car and protect its occupants. add all the options, including things like a nappa leather dashboard and organic light-emitting diode taillights complete with an animation sequence, and the a8 can top $120,000. audi promises a v-8 model by summer 2019. that will no doubt raise the ceiling even more, but the a8 has plenty of room to go: with lavish options, a v-8 bmw 7 series can top $150,000, and a v-8 mercedes-amg s-class can exceed $200,000.